Seven Pounds is a 2008 film, directed by Gabriele Muccino. Will Smith stars as a man who sets out to change the lives of seven people. Rosario Dawson, Woody Harrelson, and Barry Pepper star. The film was released in theaters in the United States and Canada on December 19, 2008, by Columbia Pictures. Despite generally negative reviews from critics it was a box office success, grossing $168,167,691 worldwide, three times its $55 million dollar production budget. Tim Thomas (Will Smith), reading a text message while driving, causes a car crash in which seven people died: six strangers and his fiancee, Sarah Jenson (Robinne Lee). In a bid for redemption, Tim sets out to save the lives of seven good people. A year after the crash, having quit his job as an aeronautical engineer, Tim donates a lung lobe to his brother, Ben (Michael Ealy), an IRS employee. Six months later he donates part of his liver to a child services worker named Holly (Judyann Elder). After that, he begins searching for more candidates to receive donations. He finds George (Bill Smitrovich), a junior hockey coach, and donates a kidney to him, and donates bone marrow to a young boy named Nicholas (Quintin Kelley). Two weeks before he dies, he contacts Holly and asks if she knows anyone who deserves help. She suggests Connie Tepos (Elpidia Carrillo), who lives with an abusive boyfriend. Tim moves out of his house and into a local motel, taking with him his pet box jellyfish. One night, after being beaten, Connie contacts Tim and he gives her the keys to his house and decides she is worthy. He then contacts Emily Posa (Rosario Dawson), a self-employed greeting card printer who has a heart condition and a rare blood type. He spends time with her, weeding her garden and fixing her rare Heidelberg Windmill press. He begins to fall in love with her and decides that as her condition has worsened he needs to make his donation. Tim’s brother Ben tracks him down at Emily’s house, demanding that Tim return Ben’s IRS credentials. After an interlude with Emily, Tim leaves her sleeping and returns to the motel. He fills the bathtub with ice water to preserve his vital organs, climbs in, and commits suicide by pulling his box jellyfish into the water with him. His friend Dan (Barry Pepper) acts as executor to ensure that his organs are donated to Emily and Ezra. Ezra Turner receives his corneas and Emily receives his heart. Afterward, Emily meets Ezra at his concert at a park, and she feels reunited with Tim as she looks into his eyes. 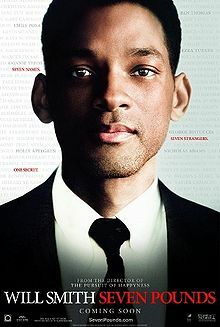 Seven Pounds is based on a script written by Grant Nieporte under Columbia Pictures. In June 2006, Will Smith joined the studio to star in the planned film and to serve as one of its producers. In September 2007, director Gabriele Muccino, who worked with Smith on The Pursuit of Happyness (2006), was attached to direct Seven Pounds, bringing along his creative team from the 2006 film. Smith was joined by Rosario Dawson and Woody Harrelson the following December to star in Seven Pounds. Filming began in February 2008. ‘Seven Pounds difilmkan berdasarkan naskah Grant Nieporte dibawah Columbia Pictures. Pada Juni 2006, Will Smith bergabung dengan studio joined the studio untuk membintangi sebuah film dan menjadi produser dari film tersebut. Pada September 2007, sutradara Gabriele Muccino, yang bekerja sama Smith dalam The Pursuit of Happyness (2006), juga diminta untuk mengarahkan Seven Pounds, membawa tim kreatif dari film 2006. Smith bekerja sama dengan Rosario Dawson dan Woody Harrelson pada December untuk membintangu Seven Pounds. Film dimulai pada Februari 2008. Most of the film was shot in various locations around Los Angeles, Pasadena, California and Malibu, California. Points of interest used in the film include the Travel Inn in Tujunga, California, the Colorado Bar, The Huntington Library, The Sheraton and The Pasadena Ice Skating Rink all in Pasadena, as well as Malibu Beach in Malibu. • Will Smith sebagai Tim Thomas, dengan identitas Ben Thomas. • Michael Ealy sebagai Ben Thomas, adik Tim dan agen IRS. • Barry Pepper sebagai Dan Morris, Teman Tim dan pelaksana wasiatnya. • Rosario Dawson sebagai Emily Posa, seorang wirausaha percetakan kart ucapan dan wanita yang disukai Tim. • Woody Harrelson sebagai Ezra Turner, seorang sales buta yang bisa bermain piano. • Elpidia Carrillo sebagai Connie Tepos, seorang wanita yang mengalami masalah dalam hubungan dengan pacarnya. • Judyann Elder sebagai Holly, seorang gadis petugas kebersihan. • Bill Smitrovich sebagai George, seorang pelatih hockey muda. • Quintin Kelly sebagai Nicholas, seorang bocah.